PYREXIA, Started out in 1990 in the NY Death Metal scene, they are one of the original NY/Slam sounding bands. Currently on Unique Leader Records and releasing their 5th full length album this Summer! 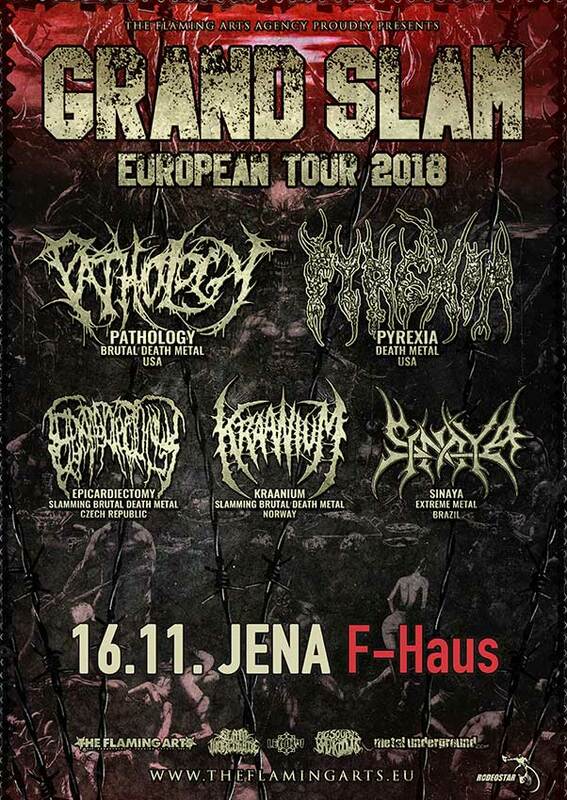 PATHOLOGY, are one of the major names in the Slam category, they are one of the first names you think of when you say the word slam! Originating in 2006 from San Diego USA, they have released 8 studio albums and releasing their 9th album this fall. PATHOLOGY is epitomized as the ultimate death metal assault to the ears. Since their formation in 2006, the San Diego-based band has managed to release a new album almost every single year since their inception, and have sold over 100,000 albums in the underground scene. The band’s hunger to churn out bludgeoning metal coupled with meaningful themes instantly separates them from the rest. KRAANIUM, from the land of Black Metal comes a band that has been gaining a lot of momentum within the Slam/Death Metal scene. Kraanium was formed in 2001 and over the years they have released 4 full length studio albums, 2 split albums as well as a live DVD. Their 5th studio album “SLAMCHOSIS” is set to be released summer 2018. Since the passing of their dear brother Martin Funderud, 1978-2017, the band is dedicated to honour him as well as his passion for brutal music and will continue spreading the brutality of slam. Rest in Power..
SINAYA, on their debut voyage through Europe, the Brazilian all-girl Death Metal band will steam through crowds like a freight train, leaving them begging for more!